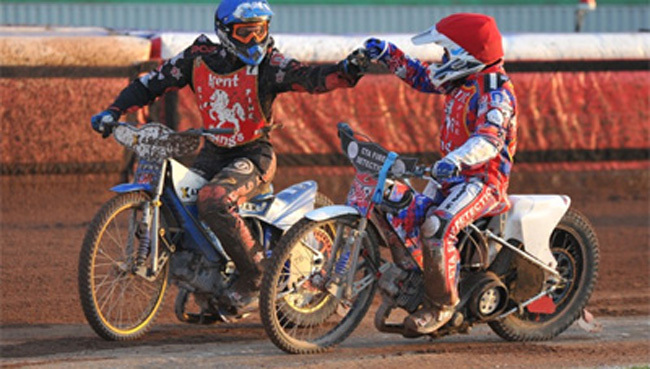 Turning back the years, a truly ‘Magic’ performance by vice-captain (skipper for the day) David Mason stole the show on Monday (19/5) as the Kent CTA Fire Kings successfully saw off the Devon Demons to reach the quarter-finals of Speedway’s National League Knock-out Cup with plenty to spare. 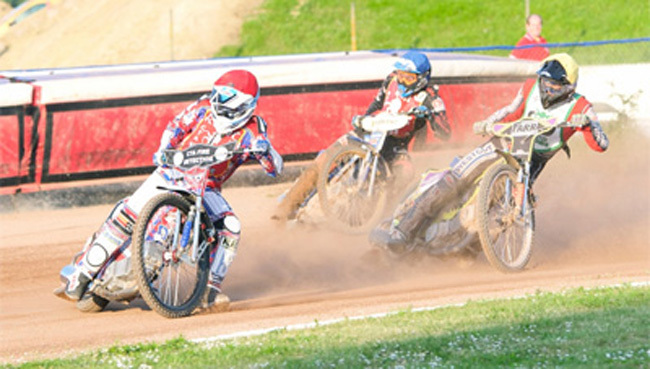 13 points ahead from the first leg, the first of three superb maximum heats Mason was involved in – showing each time the art of team riding at its very best – steadied any nerves among home supporters in heat three and the overall result of the tie never looked in any doubt from that moment on. 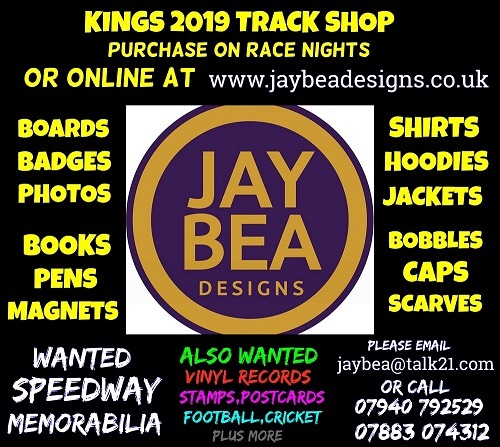 That race saw Mason out in front with Luke Chessell taking second but come heat nine it was the fast-improving Chessell who led with the Sussex-based veteran Mason using all his track craft honed over 20 years in the sport to keep the Demons’ top man James Shanes at bay and open up a 10 point lead on the evening. Better still was to come in heat 12 with Shanes again the main protagonist for the side from Plymouth and this time Mason was paired with rookie CTA Fire Kings’ reserve, Danny Ayres – the superb way in which Mason aided the plucky and determined Ayres home was poetry in motion – the delight at talking his first ever paid win at this level on the inexperienced Newmarket racer Ayres was evident even through face-mask and helmet as he took a double lap of honour with his captain. It was always going to be a home side with an unfamiliar look about it with both of the Kings’ top men missing on Elite League duty – but Simon Lambert and Ben Morley’s drafted-in guest replacements were literally faultless picks by team boss John Sampford: the hugely impressive Oli Greenwood going through the card in immaculate fashion and Steven Worrall also unbeaten by an opponent on the night.